I love this method for freezing bacon. It comes in so handy with only two of us in the house. 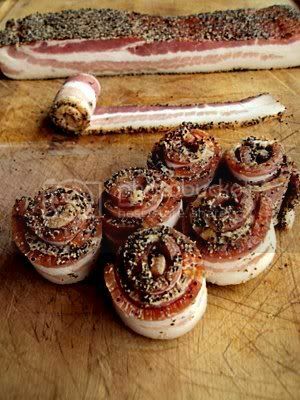 I don't have to worry about using opened bacon up anymore. To Read More, Click On The Recipe Title. Open your package of bacon , roll it up. Place the bacon in the freezer bag standing up. Freeze, after its frozen its very easy to pry them apart with a butter knife. I usually take out 3 pieces at a time and microwave for 1 minute and they are completely defrosted. This is one of the best ideas I've seen in a long time! Thanks! I'm so anxious to try this. 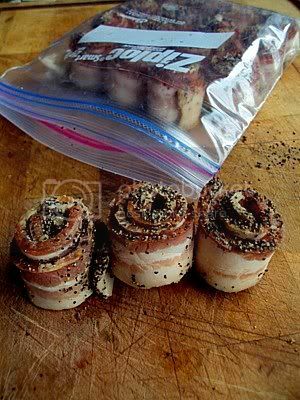 I always freeze bacon but have to defrost to seperate - this looks like a terrific idea! Thanks! this is a terrific idea. 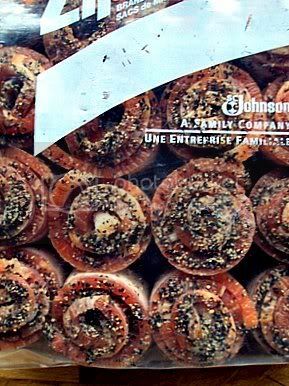 I usually roll out a long strip of plastic wrap, lay one strip down and flip with plastic, lay another strip and flip, until I have a roll of bacon strips. But curling them is brilliant-- I'm thinking it'd be fun to press brown sugar instead of pepper. I love to bake bacon in brown sugar...super yum.